Click here to open this bulletin as pdf. Holy Masses: Sunday 11am & 6pm; Mon-Sat 12:10pm daily. and on Saturdays 10am-11:45am during Eucharistic Adoration. Daily Rosary 11:30am Mon-Fri, 11am Sat. Followed by the Angelus. Safeguarding: Children, teenagers and vulnerable adults must be accompanied or supervised at all times within the Shrine. If you have concerns, please contact the Archdiocesan Safeguarding Department on 0151 522 1043 or e-mail safeguarding@rcaol.co.uk, or speak with Clare Fraser, St Mary’s Safeguarding Officer. Thank you for your awareness. Changes of assignment: As expected after our General Chapter last month, priests were re-assigned across our various apostolates. Fr James Mawdsley (who trained in the German-speaking section of our European seminary) goes to Vienna, Austria and will be succeeded in Reading by Fr Seth Phipps. We are sorry to see Fr Phipps go and we assure him – and Fr Mawdsley – of our prayers in their new assignments. Your clergy at St Mary’s remains the same, with Frs de Malleray, Loewenstein and Verrier. If we want it to happen, our best asset is PRAYER. Prominent Catholics have lent their support to our project: Jacob Rees-Mogg MP; Archbishop Malcolm McMahon OP; Viscountess Ashbrook, of nearby Arley Hall; SPUC Chairman Robin Haig; Robert Colquhoun of 40 Days for Life; Dr Joseph Shaw, Chairman of the Latin Mass Society, and Maria Haynes, North West Coordinator of the National Association of Catholic Families. We have three months to raise £1.5m and buy back the former Priory and St Mary’s School next door (total Net Internal Area of 1,383.19 Sq m or 14,891 Sq ft.) This is a unique opportunity to endow St Mary’s with the space we urgently need: parish hall, music room, clergy offices, and classrooms. In addition, a pro-life office, a publishing company, a catholic bookshop, a vestments-sewing workshop and accommodation for retreatants could be added. We have £300,000.00 pledged. Just as we expect this project to benefit souls even at a distance from Warrington, we seek support from far and wide, not only among our local congregation. In our times of growing adversity, the Priory Campaign aims at building a strongly Catholic community. Please speak to your friends about this historic opportunity, and pray for generous benefactors. At this stage, we request pledges rather than actual donations. Kindly specify amount, currency and confirm bank transfer by 15 September. Our Campaign bank account details will be advertised by early September. Every able Catholic must attend Holy Mass on that day under penalty of grave sin. If you plan to travel that day, check online in advance where you will fulfil the obligation. Let us celebrate the glorious entering of our Mother in heaven! 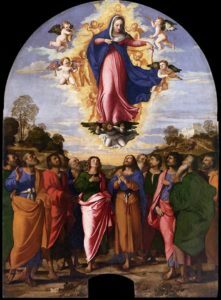 Almighty and Eternal God, who hast assumed the body and soul of the Immaculate Virgin Mary, Mother of Thy Son, to celestial glory: grant, we beseech Thee, that always minded toward heavenly things, we may be sharers in the same glory. Through our Lord Jesus Christ, Thy Son, Who livest and reignest with Thee, in the unity of the Holy Ghost, one God, world without end. Amen. Congratulations to Clare Fraser who has completed her training as new Safeguarding Officer at St Mary’s Shrine. Clare is part of the Bl. James Bell Parish Safeguarding Team. Please pray for the success of our summer camps this week (30 girls) in Macclesfield. 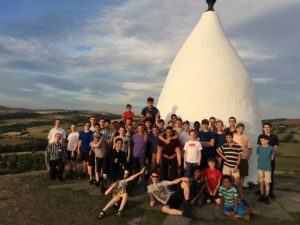 Our 40 boys had a great time last week! See pictures on Flickr FSSP England. Baronius hand missals: new bulk order. Another 30 copies should arrive here within a fortnight. We will let you know when they do. Discount price: £37.00 each. Thank you for welcoming Fr Matthew Jolley on Saturday before last, after his first EF Mass here at St Mary’s since his ordination in July 2015. Watch Holy Mass at St Mary’s daily on www.livemass.org. The Mass of the day can be watched for 24hrs and that of the Sunday for the entire week. Reminder: To receive Holy Communion: to be a Catholic, in state of grace, one-hour fasting. In the EF liturgy, Holy Communion is received kneeling (unless unable to) and always on the tongue. Thank you in advance. 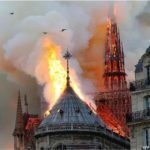 Notre-Dame in flames, mirror of our times.